When Ms Sumo first told us Australia Dairy Co, I thought? Aren't we in Hong Kong?? Why are we having milk? 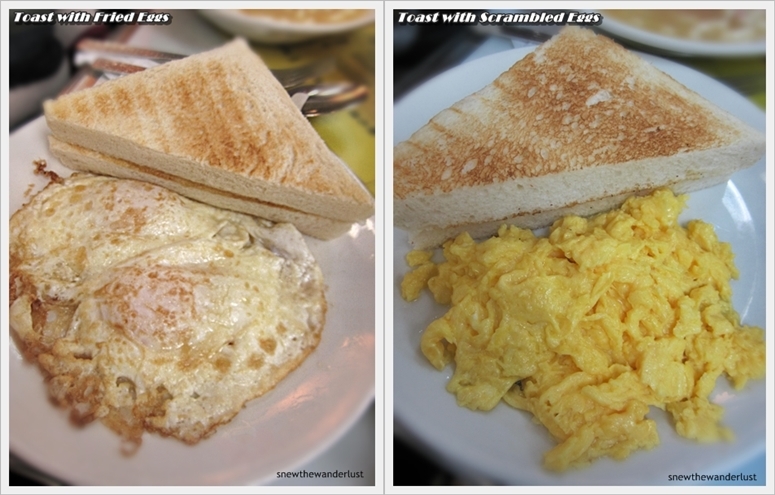 So, she explained that for breakfast this shop serves Toast Bread, Eggs & Macaroni for breakfast. Since it's strongly recommended, we decide to try it. When we arrived at around 9am, there was a line queueing up for seat. Fortunately, the queue was not too long. Within 5 minutes, we could get a seat. However, all parties must be present. Be prepared to share table with others and it's a kind of a squeeze at times. Breakfast menu comes in a set. Well, you can order ala-carte, but almost everyone orders the set. We ordered Set A - comes with Toast Bread, Eggs, Macaroni Soup & Coffee/ Tea. Most patrons order this set as well. I love macaroni soup. Even if it's a simple meal, I can have that for breakfast, lunch & dinner! This especially, taste yummy! You have a choice of either Scrambled Eggs or Fried Egg. The thick toast type, this is really delicious. The bread is toasted just right, not too soft or over toasted. The bread is still soft but yet have the crispy feel. With butter smeared in the middle, this is simply heaven! Somehow, I wonder how to make the perfect toast. Even things that are as simple as this, I can't seem to master it at my own's kitchen. 3rd Course - Coffee / Tea? What's Hong Kong without tasting it's milk tea?. But of course, you can also choose to have coffee. Our seat was near the food preparation area, so I took a peep at what the chef is preparing. I believe it's for the afternoon or evening serving as he is preparing for steamed egg pudding and steamed milk pudding. Again, I took a peep at what they would be serving after breakfast. The steamed egg pudding and steamed milk pudding really looks delicious. Too bad I didn't have a chance to return to try it. I'll definitely return to try it the next time I'm in Hong Kong.